If humans ruin or outgrow Earth, are there other planets we can hope to colonize? amounts of carbon into the Martian atmosphere much as we are doing on Earth but to a larger extent. In theory, this carbon seeding plan would cause the atmosphere to grow and eventually shield much of the radiation that would otherwise be harmful to Martians. 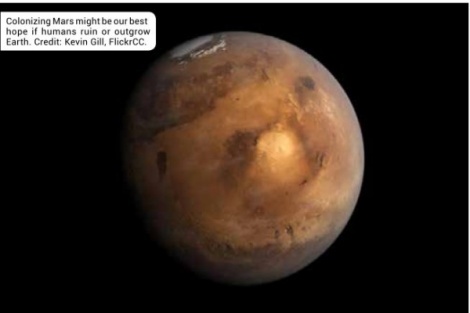 Since carbon dioxide is the main gaseous nutrient consumed by plants, it’s possible that many plants could thrive on Mars. Without competition, plants could take over the planet and put oxygen into the atmosphere, eventually making it possible for humans and other animals to populate Mars without oxygen masks. CONTACTS: NASA, www.nasa.gov; Blue Origin, www.blueorigin.com; SpaceX, www. spacex.com; The Mars Society, www.marssociety. org. Dear Earth Talk: This Month´s Topic: Sweden´s Environmental LeadershipTeaching kids to consumeFinding "Green Job"